Chai is a personal favourite beverage and is best enjoyed in cooler weather. As the first day of Winter is just tomorrow, I have chai on my mind and by the time you have read this blog I hope you will too. There’s something really comforting about having a ‘sit down and a nice cup of tea’. Chai takes this experience up a notch – we spice the tea up. This style of tea is wonderfully fragrant and warms you from within. The word ‘chai’ is the name given to tea in India and refers to the way in which Indians often take their tea. 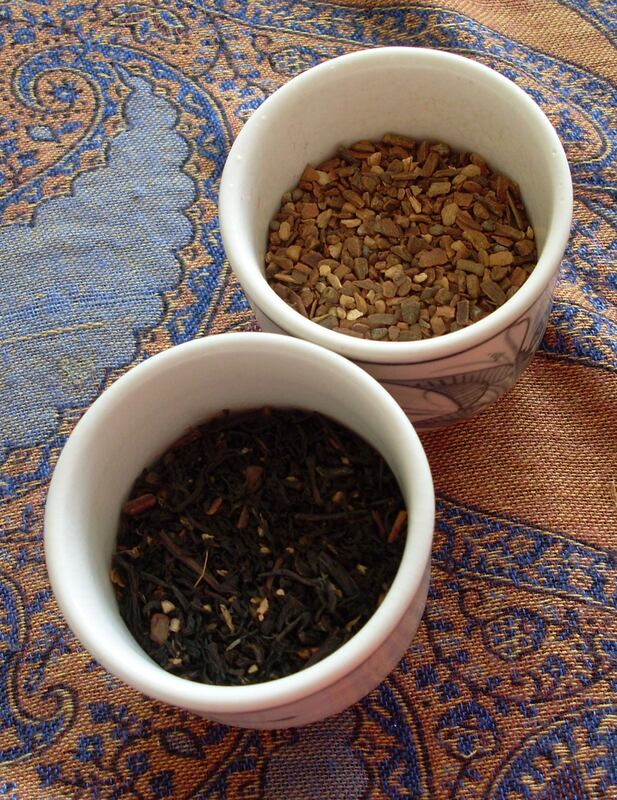 Most chai teas use a combination of spices that are often found in Indian cooking and herbal medicine such as cinnamon, ginger, cloves, cardamom and black pepper, but the ingredients vary from chai to chai. It can include black tea, green tea or simply the spices alone as an herbal tea. Likewise, milk is optional, and even then you can choose from cow (not for the vegans or dairy-free amongst us), soy, rice or nut milks. Your chai can be sweetened with honey or sugar. Bare in mind the milkier and sweeter your chai is, the more likely it is to also create phlegm, although, the warming spices should aid digestion to some degree. So, as usual, moderation is the key. You can make your own chai with a recipe like this one or purchase some loose leaf chai from a shop that supplies good quality teas, don’t bother with the supermarket ones. There is an old saying that goes “Eat breakfast like an emperor, lunch like a king and dinner like a pauper”. That is, make breakfast a larger, nutritious meal, lunch as a moderate meal and dinner, well something light so as not to distract you from a sound slumber. So, breakfast as an Emperor, what does that mean? The Emperor (or Empress) needs breakfast to provide him (or her) with energy for the day, both physically and mentally. And so do you. To enjoy a good breakfast, firstly you need to wake with a good appetite. If you don’t, this needs attention and should be brought up with your acupuncturist, herbalist or naturopath. Keep it interesting. Eat as many different foods in your meal as is reasonably possible and heightens the taste and enjoyment factor. Choose different colours and textures. Make sure to include a mix of protein, high quality carbohydrates and good fats. Think: wholegrains, nuts, seeds, fruits and spices. Warm is best. Stoke your digestive fire for your first meal of the day with a warm, cooked meal. Portion size. Usually the rule of eating until you are 80% full is a useful way to judge the size of your breakfast. There is no need to skimp as this meal should keep you satisfied until your mid-morning snack. Add 1/4 cup hulled millet (or brown rice), 1 grated apple, a handful of almonds and your choice of seeds (eg. sunflower, linseed) to a saucepan with 1 cup water. Boil, then reduce heat to a simmer until no water remains and millet/rice is cooked through. Serve with a dessert spoon of tahini, a sprinkle of LSA and some fresh berries. 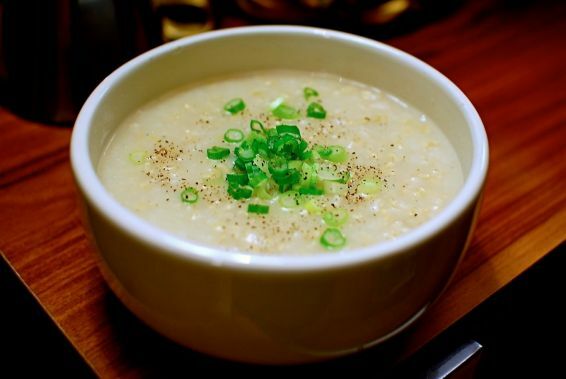 Congee with ginger and shallots (and chicken or tofu or egg) – make this one in advance and freeze in portions. Add to a large saucepan: 1 cup of brown rice, 6 cups of water, 1 tablespoon of grated ginger, 6 sliced shallots (white part only), 1 tablespoon soy sauce and optional: 1 whole organic chicken (skinned). Bring to the boil then simmer covered for 3 hours or until rice is mushy, resembling porridge. If using chicken, remove bones from the soup. For the vegetarian version, omit the chicken, now add 1 cup of mashed silken tofu and stir through rice mixture until warmed through or poach an egg and serve on top of the congee. Top with chopped coriander and sliced green shallots. I find this recipe is best made in advance and frozen in single serve portions to be quickly reheated as needed. This is a good winter breakfast to fire up the furnaces. Poach some eggs, toast some gluten-free or your favourite wholemeal bread. Top the toast with avocado, a few slices of tomato and some baby spinach. Garnish with a few basil leaves. When you are in a hurry, having some good quality organic muesli on hand can be your saviour. I like Therapeutic Gourmet’s ‘Get up and Goji’ available from health food stores and the West End Markets. Serve with warm rice, nut or soy milk. It’s easy to live a healthy life if you have plenty of time. Taking your time to cook wholesome food, get enough exercise, practice some meditation and have enough sleep all take time. Precious time. Something that many of us seem to have a lot less of than we’d like. If being time-poor is your reality, then we need to work with the time we have more smartly. My answer is to make a routine. It’s just as important to prioritise your ‘you time’ as it to schedule work and family commitments. You need to book in time to nurture yourself when it suits you or you’ll end up being ill when it isn’t convenient, and that may really throw a spanner in the works at a later time. 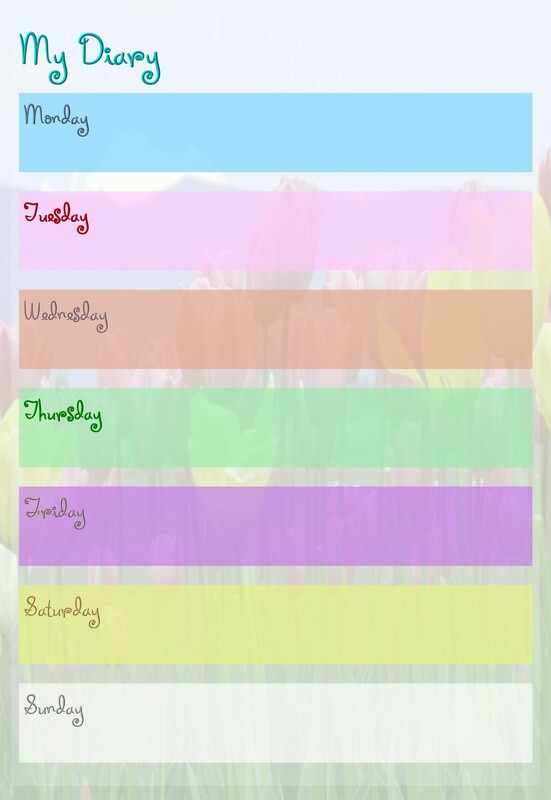 Make a list or timetable of all of the activities you do in a week. 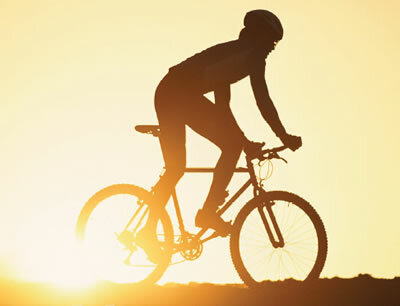 Include work, family, housework, sporting commitments and other activities. Work out when you have any spare time. We need to know this so that we can use it wisely rather than flitting it away without valuing it. You may be surprised when you look at your week on paper. Perhaps there are some activities you are overdoing and are able to cut back on. Think of the areas of your health that suffer when you are busy. Often making home cooked meals gets neglected, as does exercise and relaxation. Make a note of these. Find gaps in your current schedule where you can add some of these healthful activities and write them in. It may be that you can cook a meal on one night/day to provide several lunches and dinners (avoiding the need for unhealthy takeaway meals). Perhaps you can find a gap that can allow you to get some incidental exercise, a run or even an exercise class that fits around your current activities. If relaxation always gets left behind, schedule yourself some time for a DIY facial, bath, meditation, massage or other treatment of your choice. Remember these activities are important! Make sure not to fill in all of your spare time. Write down your new schedule. Put it somewhere that you can always refer to it. It doesn’t have to be set in stone but rather something to aim for. Whether it’s on paper, in your diary, a spreadsheet or your iPhone/iPad do what will work for you. Some people find that daily lists work, for others a weekly timetable is preferred. What you have created should help you to know what you have to do each day and what the consequence will be if you don’t get to it (eg. if I miss cooking a meal to last for a few lunches, I won’t have time to do it later and I’ll have to get takeaway). This is motivating but also allows for informed choice from week to week as the unforseen will always happen from time-to-time. So, even though you have a ‘perfect health-promoting schedule’, remain flexible. Things just don’t go to plan all the time and we don’t want to turn down wonderful opportunities that come our way or get more stressed if we don’t tick everything off our list. It’s also not locked in for life. It can come and go as you need it, and be changed as often as required. This solution won’t work for everyone, but if you are feeling overwhelmed by commitments and they are eating into your ‘you time’, then putting your time on paper is a good place to start. 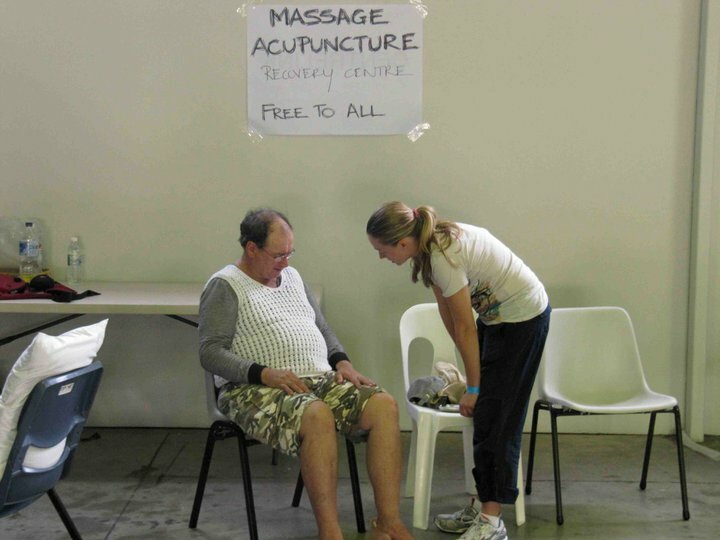 The important message here is, however you put it into action, when you are busy, looking after yourself is just as important as when you are not.